Donald Hamilton sadly passed away in September 2009. He exhibited his highly acclaimed work in Paris New York Tokyo Zurich and many other cities around the world. The list of galleries that own or have exhibited his work is phenomenal. Donald Hamilton participated in many of the most significant exhibitions of British work including the Royal Academy’s 25 Years of British Painting, where he was also a Royal Academician and a trustee since 1995. 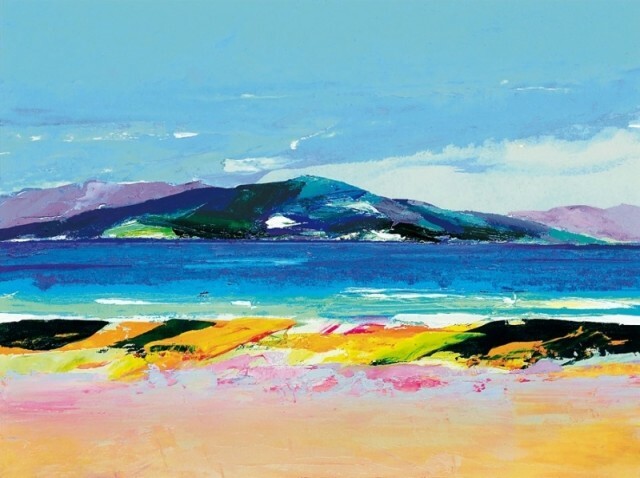 Donald Hamilton’s predominant subject matter was landscape. Here he combined his Scottish decent and his affinity with French painting from his study there in the 1950’s. This is greatly reflected in his style and execution. He layered thick bright paint with a palette knife to produce an almost collage effect. The landscapes remain close to their origins whilst forming abstract almost dream-like fields of colour. Contrasting in style and highlighting Donald Hamilton’s diversity are his wonderful chalk and wash drawings of dancers. Each one captures individual character and emotion whilst revealing his intimate knowledge of dance. After much study and travel including tutoring at the Royal College of Art, contact with the post war Ecole de Paris, and a long relationship with the Royal Academy Donald lived with his wife by the river at Henley on Thames.